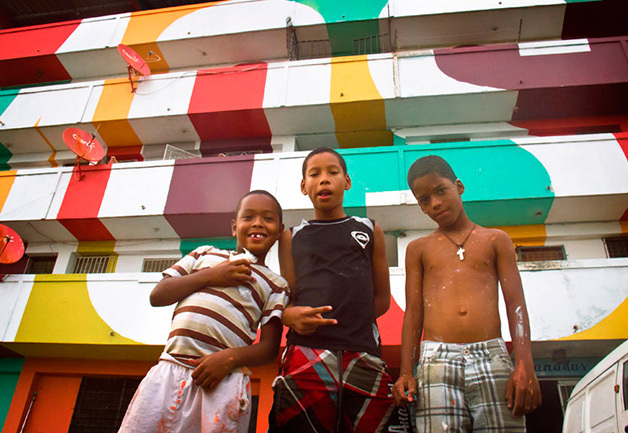 Young volunteers enjoy El Chorrillo’s newly colorful apartment complex. Photo courtesy of Hypeness. The message is intended to inspire the whole neighborhood to realize the value of its urban space and the people themselves who live there. The colorful intervention allowed the residents to express their individuality and improve their urban environment at the same time. 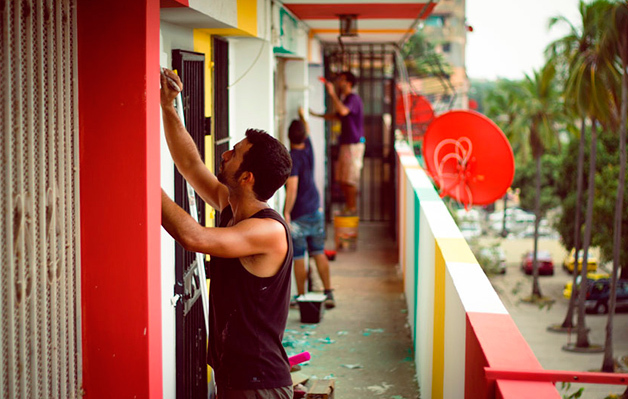 The many bright colors which now cover the building’s façade were chosen by the volunteer “artists” – the community members who painted over 2 million square feet of stairs, hallways, balconies, and doors. 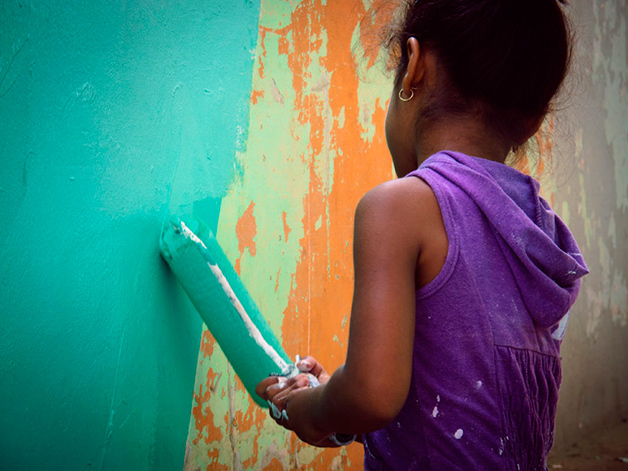 Community members covered over 2 million square feet in colorful paint. Photo courtesy of Hypeness. The project was organized by Boa Mistura, a collective of five graffiti artists from Madrid, Spain, whose aim is to use participatory urban art as a tool for revitalizing run-down communities and helping residents to improve their environment. This project is part of Boa Mistura’s series, “Crossroads,” which has included projects in Cape Town, South Africa; Algiers, Algeria; and Sao Paolo, Brazil. 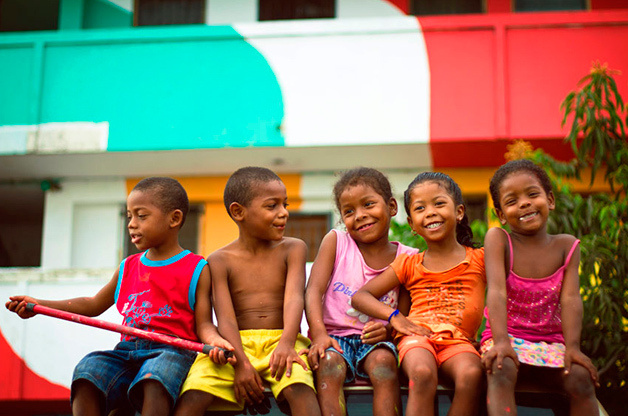 In Sao Paolo, they led a community rejuvenation of a favela where residents painted favela corridors with bright colors and inspiring words which appeared to float in mid-air. 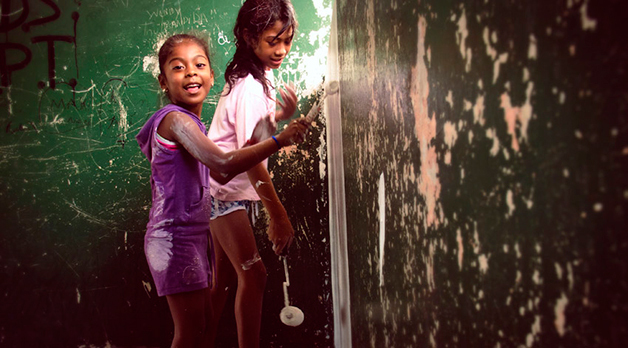 Boa Mistura’s project in Panama is sponsored by the First Biennial of the South in Panama 2013, an international art project which aims to encourage artistic and cultural community engagement. The residents of this building are not the only beneficiaries of this colorful community project— the entire neighborhood has been rejuvenated with color and a renewed focus on the value of beautiful urban spaces. 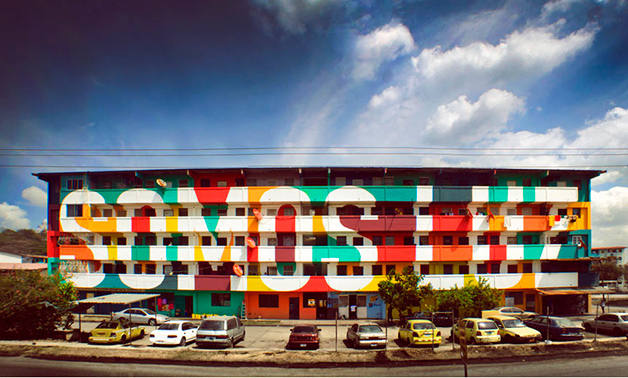 The apartment building now reads “Somos luz” or “We are light.” Photo courtesy of Hypeness. Residents young and old pitched in to help rejuvenate the run-down public space. Photo courtesy of Hypeness. 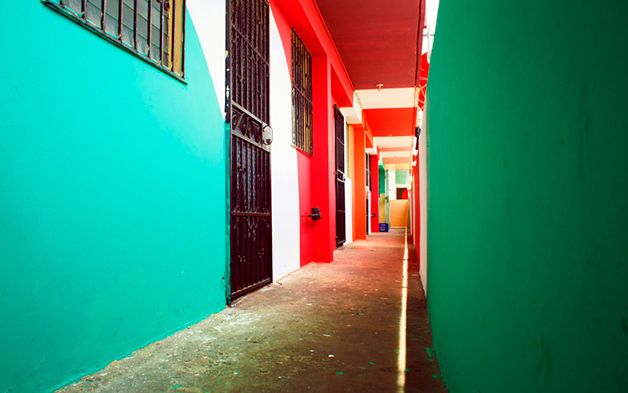 Colors were chosen by the residents and volunteer painters. The bright colors distinguish each individual home and balcony, giving a sense of ownership and individuality. Photo courtesy of Hypeness. The new paint job revitalizes what was an ageing, run-down building. Photo courtesy of Hypeness. This blog was initially posted in Portuguese on TheCityFixBrasil.com and can be read here.